Brent Cobb's 'Providence Canyon' Is Full Of Swampy Grooves Nobody is more fluent in country-funk than Brent Cobb. Brent Cobb's Providence Canyon comes out May 11. Throwback soul and honky-tonk never seem to go entirely out of fashion. Both breakthrough acts and performers building small followings on the vinylphile fringes have embraced those aesthetics as vehicles for emotional grit and analog authenticity. That hasn't been as true of country-funk, a vintage style far more prone to periods of obscurity, but which is now enjoying a quiet resurgence. Earlier this decade, the reissue label Light In the Attic assembled a pair of country-funk collections, which inspired Margo Price and her band to dabble in swampier grooves on last year's album (see: "Cocaine Cowboy" and "A Little Pain"). Brothers Osborne covered Don Williams' chugging, danceable classic "Tulsa Time" on the 2017 CMA Awards, and riffed on the devilish, clowning churn of some of Jerry Reed's most lighthearted hits this year. Sam Morrow, an emerging figure in the west coast Americana scene, stocked his new album with leisurely, twangy syncopation. 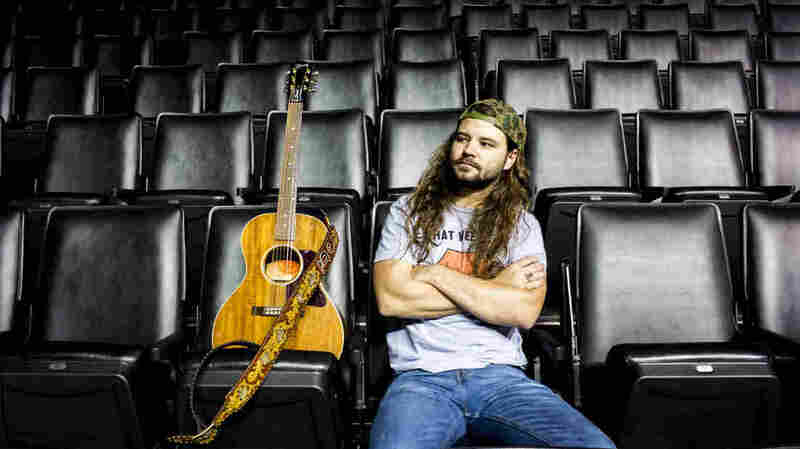 But nobody is more fluent in country-funk than Brent Cobb. As rich as his 2016 album, Shine on Rainy Day, was in sauntering, acoustic storytelling, his latest, Providence Canyon, is burlier, deeper in the pocket and even more satisfying. The Georgia-bred singer and songwriter offers a plausible enough reason for the shift in his official bio: "When you're touring with Chris Stapleton, and you're performing to a crowd of 10,000 people before he hits the stage, you find yourself wanting to play something upbeat." But Cobb (who shares a white-hot producer, his cousin Dave, with Stapleton) didn't merely plug in and turn up the volume. He applied as much wit and craftsmanship to the feel of the 11 tracks as he did to the songwriting itself, enhancing the textures of his down-home settings and characters — and that's saying a lot for a guy who enjoyed his first Nashville successes as a Music Row songsmith. Cobb has a real knack for bringing small-town troublemaking to life. His take on the rash barroom pleasure-seekers in both "Mornin's Gonna Come" and "Sucker for a Good Time" is a droll one. In the former, he does his taletelling over an interlocking pattern of wily, leapfrogging acoustic and electric guitar licks. (Here and elsewhere, his touring guitarist Mike Harris plays a central role.) In "Sucker," the acoustic guitar and bass deliver alternating segments of a fluent, insinuating lick, sometimes accompanied by wild-eyed slide guitar, while Cobb plays the part of a comically unreliable narrator, constantly placing himself in the crosshairs of jealous boyfriends and husbands. "She was a lap cat, man, I never had nothing like her, and I ain't the kind to scratch out a lie," he brags in an unruffled drawl. The percolating, deeply funky ".30-06" — one of a couple of tracks on which Cobb's kindred musical mind Charlie Worsham contributes bluesy soloing — tells another side of the story. "This town's too small to be playing those kinda games," Cobb threatens, supported by gospelly harmonies from session singer Kristen Rogers. "Messing around with another man's woman gonna cause all kinds of pain. It won't be mine, I'll tell you one time. Don't cross that line, or you're gonna get fixed with a 30 aught six." Cobb barely mentions the real-life violence that took the life of the subject of his song "King of Alabama," hard-touring country bar bandleader Wayne Mills. The way that Mills died is beside the point; Cobb wants to celebrate the way that he lived. "Some people calculate moves," he sings, his phrasing dawdling just behind the beat. "He never had a thing to prove. He just let the wind take him where it may." Such admiration rings especially true coming from an artist who relishes repeating the story of his songwriter dad declining to pursue a big-time Nashville career because it would take him away from home. Cobb's own concerns about getting caught up in the demands of the marketplace come through in a few autobiographical-sounding songs, including the soft and easy country-rocker "Come Home Soon." "Music used to be my way to escape the good, the bad and everything between," he reflects, his worry evidently too low-grade to trouble his delivery. "Now it's become what defines my name. Oh, I wonder who it was I used to be." There's a line in album closer "Ain't a Road Too Long" that probably comes closest to nailing Cobb's artistic ethic: "I only do the sort of work that pleases me." The way he delivers it — with a rhythmically relaxed, talking blues flow, skating over a sinuous, circling riff and springy drum groove — makes the sentiment completely convincing, even contagious. Who wouldn't want to be as comfortable in their skin as Cobb's is on Providence Canyon?